It's early April in Georgia, and many of the dogwood blooms are already past peak. But not these guys. Decatur (Sycamore Street neighborhood), Georgia. 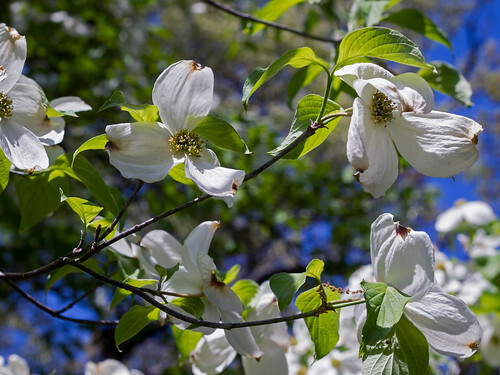 ▶ "The four showy flower petals of the flowering dogwood (Cornus florida) aren’t actually petals as botanists define them. The dogwood petals instead are modified leaves called bracts that surround a cluster of about 20 tiny yellow flowers. As the flowers bloom, the showy bracts expand to attract pollinating insects. Each bract has a dark red-brown indentation at its tip. Depending on location, dogwood trees may bloom in March, April or May for about two weeks. When pollinated, the flowers produce red berries relished by wildlife."